Our services include, but are not limited to, products, events, print and digital newsletters, publications, economic reports and analyses, training and certification programs. Events include in-person or virtual, workshops and forums, conferences, seminars, webinars, board meetings, and division, committee, council and task force meetings. 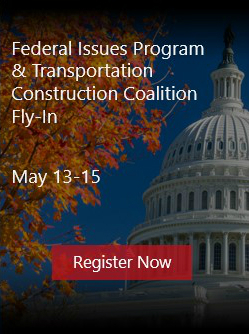 By visiting ARTBA’s flagship www.artba.org or related Sites, you acknowledge that you have read and understood the processes and policies referred to in the Policy. We may collect and process some or all your Personal Data. Contact Information: Any data that you provide when corresponding with us by phone, e-mail or otherwise. This could include your name, company, organization or agency, address, e-mail, phone numbers (work and mobile), and credit card information. Membership Information: All data related to your membership, including your name, contact details such as address, phone number and email (business or personal), job title, and other relevant information. Dues Payment: The financial information such as credit card and account/routing numbers used to register or renew your membership. Purchases: Items you bought related to transactions made on artbastore.org. Certification Credentials: Any data related to the ARTBA Foundation’s Safety Certification for Transportation Project ProfessionalsTM (SCTPP) program, in which members/non-members are granted certification if they meet specified educational/employment experience requirements and pass a certification exam. This may include extensive information about the experience/performance of those applying for certification. With regard to each of your visits to our Sites, we collect certain Personal Information that can be used to contact or identify you, such as: (1) the Internet Protocol (IP); (2) information voluntarily submitted on publication order forms, meeting registration forms or e-mails sent to the website administrator, or for access to the Members’ Only section of www.artba.org; and (3) Cookies, if you so choose. ARTBA’s use of IP addresses also allows us to diagnose problems with our server and to administer our Sites more efficiently. We do not use IP addresses to personally identify users. We will also use Personal Information to contact you via email or regular mail with newsletters, marketing or promotional materials, and other ARTBA-related business matters. Enable users to visit our Sites and take advantage of their many features. Carry out our obligations arising from your membership. Process and fulfill your transactions. Respond to your requests, questions and concerns. Send you marketing and other communications about meetings and events, products, services and other ARTBA-related business matters that might be of interest. You have the ability to Opt-in or Opt-out of these communications. Tailor ads displayed on our Sites to your interests and history with us. Notify you about changes to our membership services. Ensure that content on our Sites is presented most effectively for you. Enhance and develop any new products, services or other offerings. We may retain and store your Personal Data, in a form that permits us to identify you, and retain such information as long as necessary, to comply with our legal obligations, resolve disputes, and enforce our agreements and rights. If you wish to cancel your account or request that we no longer use your information to provide you service, contact ARTBA Director of Member Services, Records & Chapter Relations Allison Rose. ARTBA does not sell your personal data to outside third parties. On occasion, ARTBA’s Preferred Vendors, who are also members, are allowed access to select member information for marketing or promotional purposes. These vendors are bound by strict confidentiality agreements. The association will use its best efforts to prevent the government from obtaining member or customer information, unless required by law. Although we use the latest technologies to protect your Personal Data against loss, misuse or unauthorized disclosure, we cannot guarantee the absolute security of information transmitted to us over the internet. Only authorized employees or agents are permitted to have access to Personal Information about website visitors, and that access is limited to what is reasonably needed to perform an employee’s responsibilities, such as providing updates or notices or customer service. All information you provide us is stored on secure servers. ARTBA is based in the United States. Your Personal Data may be accessed by us or transferred to us in the United States or to our affiliates, partners, or service providers who are located worldwide. If you are visiting our Sites from outside the United States, be aware that your information may be transferred to, stored, and processed in the United States where our servers are located, and our central database is operated. By using our Sites, you consent to any transfer of this information. You do not have to accept Cookies and consent can be withdrawn at any time (see How to Control Cookies, below). You can change your browser settings to refuse or restrict Cookies, and you may delete them after they have been placed on your device at any time. If you do not accept or delete our Cookies, some areas of our Sites that you access may take more time to work or may not function properly. Cookies are small amounts of information that we may store on your local computer or mobile device when you visit our Sites. When you visit our Sites again, Cookies allow us to recognize your browser. Cookies may store your preferences and other information but cannot read data off your hard disk or read cookie files created by other sites. You can learn more about Cookies at http://www.allaboutcookies.org. Cookies set by a website owner (in this case, ARTBA) are called “first party Cookies.” Cookies set by parties other than the website owner are called “third party Cookies.” Third party Cookies enable us to provide third party features or functionality through our Sites (i.e. advertising, social media functions and analytics). The information we collect with Cookies allows us to statistically analyze usage of the Sites, and to improve and customize our content and other offerings. However, we would only disclose information collected with Cookies to third-parties on an aggregated basis without the use of any information that personally identifies you. These are Cookies that are required for the operation of our Sites. They include, for example, Cookies that enable you to log into secure areas of our websites or use a shopping cart or make use of e-billing. These Cookies are strictly necessary to deliver the Sites and therefore cannot be refused. ARTBA uses tracking Cookies through Google Analytics. These Cookies are designed to deliver information that is of the most interest to you during your visit and beyond. The Google Analytics Cookie allows us to track, in aggregate, but in no personally identifiable way and without using personal data, traffic patterns on the site so we can optimize our web development and content efforts to better meet your needs. These may include pages visited, number of pages visited per session, or device type, operating system and browser type and version. These Cookies are used to make the advertising displayed on the Sites more relevant to you. These Cookies prevent ads from reappearing and ensure that ads are properly displayed. Certain third-party Cookies may track users over different websites and will provide ads relevant to your interests. Our Sites use other technologies to recognize and track visitors. A web beacon (also known as a “tracking pixel” or “clear GIF”) is a clear graphic image (typically a one-pixel tag) that is delivered through a web browser or HTML e-mail, typically in conjunction with a Cookie. Web beacons allow us, for example, to monitor how users move from one page within our websites to another, to track access to our communications, to understand whether users have come to our websites from an online advertisement displayed on a third-party website, to measure how ads have been viewed and to improve site performance. We do not respond to web browser “Do Not Track” signals. As such, your navigation of our Sites may be tracked as part of the gathering of quantitative user information. If you arrive at our Sites by way of a link from a third-party site that does respond to “Do Not Track” requests, the recognition of any “Do Not Track” request you have initiated will end as soon as you reach our Sites. Contact ARTBA’s Systems Developer Markus Proctor with any questions about how our Sites are using Cookies. Our Sites may contain links to third-party websites, applications and services not operated by us. These links are provided as a service and do not imply any endorsement by us of the activities or content of these sites, applications or services nor any association with their operators. ARTBA is not responsible for the privacy policies or practices of any third-party including websites or services directly linked from our Sites. We encourage you to review the privacy policies of any third-party site that you link from our Sites. With the exception of our annual Student Video Contest, the content on our sites is not directed to children under age 13. If you are a parent or guardian and discover that your child or a minor under age 13 has posted, submitted or otherwise communicated Personal Data to our Sites without your consent, please alert ARTBA Director of Member Services, Records & Chapter Relations Allison Rose so that we may take any appropriate action. If any of the information that we have about you is incorrect, you wish to have information (including Personal Data) removed from our records, or you no longer want to receive communications and marketing emails, contact ARTBA Director of Member Services, Records & Chapter Relations Allison Rose to opt-out. You can also opt-out of promotional emails by clicking on the “Unsubscribe” link within the email you receive. Should you receive a promotional email from third-parties who already have your information, please contact them directly. For European Residents Only. You have the right to ask us not to process your Personal Data for marketing purposes. We will usually inform you (before collecting your Personal Data) if we intend to use your Personal Data for such purposes or if we intend to disclose your information to any third party for such purposes. You can exercise your right to prevent such processing by checking certain boxes on the forms we use to collect your Personal Data. You can also exercise the right using the Contact Us section of our Sites. Access Your Personal Data. You may have the right to request access to any Personal Data we hold about you as well as related information, including the purposes for processing the Personal Data, the recipients or categories of recipients with whom the Personal Data has been shared, where possible, the period for which the Personal Data will be stored, the source of the Personal Data, and the existence of any automated decision making. Correct Your Personal Data. You may have the right to obtain without undue delay the rectification of any inaccurate Personal Data we hold about you. Erase Your Personal Data.You may have the right to request that Personal Data held about you is deleted. Restrict the Processing of Your Personal Data Request to Transfer Your Personal Data. You may have the right to request transfer of Personal Data directly to a third party where this is technically feasible. You can exercise any of these rights using the Contact Us section of our Sites. For California Residents Only. Section 1798.83 of the California Civil Code requires select businesses to disclose policies relating to the sharing of certain categories of your Personal Data with third parties. If you reside in California and have provided your Personal Data to ARTBA, you may request information about our disclosures of certain categories of Personal Data to third-parties for direct marketing purposes.